Opened in 1895 for the Penn Relays, Franklin Field is the oldest sports stadium in use in the United States, and was home to the nation's first scoreboard that same year. 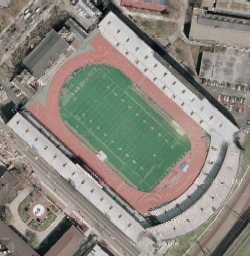 The playoff home of the Philadelphia Stars in 1984 when scheduling conflicts occurred at Veterans Stadium, Franklin Field normally was the University of Pennsylvania's home for football, lacrosse, track and field, field hockey, soccer and intramural sports as well. Franklin Field grew to seat 52,500, and from 1958 to 1970 was the home of the Philadelphia Eagles, where in 1960 the team defeated Vince Lombardi and the Green Bay Packers, 17-13, to win an NFL championship. Later it became the first NFL stadium to utilize an artifial surface. It's also the place where a man in a Santa Claus costume was pelted with snowballs. 1970 would be the last year the Eagles played at Franklin before moving to Veterans Stadium, but Franklin Field reamins in use today, hosting the Penn Relays and other Penn events, even after "The Vet" had been torn down and replaced.